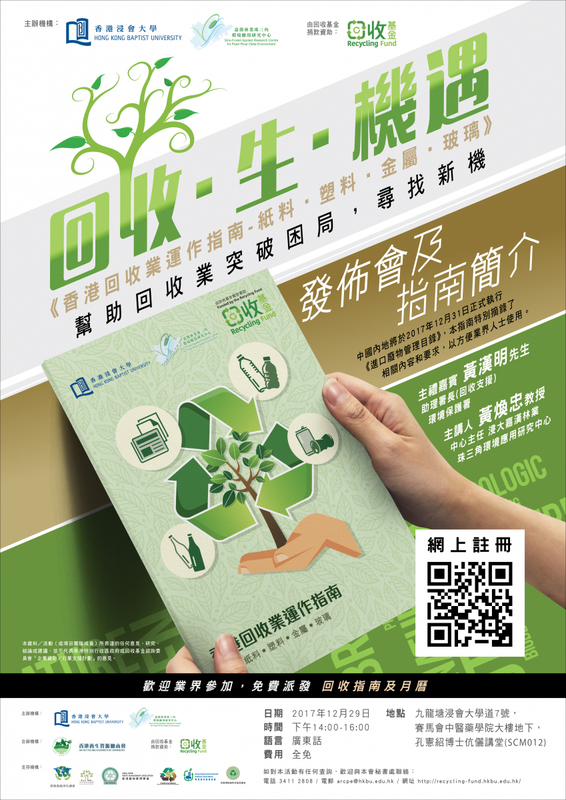 In the year of 2016, HKBU Sino-Forest Applied Research Centre for Pearl River Delta Environment (ARCPE) received funding support from The Recycling Fund to conduct a research project as "Capacity Building Programme for Waste Recycling Operators". The project is separated to two phases aiming to help the recycle industry including paper, plastic, metal and glass operations to improve operational standards. The first phase of the project, including the investigation of the recycling operation, occupational health and safety conditions, and the preparation of the "The Recycling Operational Guidelines" have been completed. The investigation was conducted by surveying 205 recycling companies focusing on the status quo of recycle items and recycle centers, the collection, handling, transportation, occupational safety and health and environmental issues and government support. The Center held a press conference on the survey report and releasing of "The Recycling Operational Guidelines" on 29th of December 2017. The director of the Center, Professor Jonathan Wong, announced the findings of the project from the aspects of operation, management, occupational health and safety, and recycling regulation in the recycling industry. About 150 participants attended the seminar, including recyclers, property managers, social organizations involved in recycling projects, environmental protection organization representatives, public policy researchers, students and citizens who are concerned about recycling issues.